Rotherhithe (/ˈrɒðərhaɪð/) is a residential district in south east London, England, and part of the London Borough of Southwark. Historically, the area was the most northeastern settlement in the county of Surrey. It is located on a peninsula on the south bank of the Thames, facing Wapping and the Isle of Dogs on the north bank, and is a part of the Docklands area. 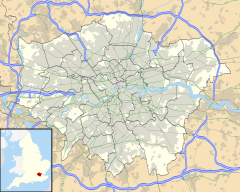 It borders Bermondsey to the west and Deptford to the south east. Rotherhithe has a long history as a port, with many shipyards from Elizabethan times until the early 20th century and with working docks until the 1970s. In the 1980s the area along the river was redeveloped as upmarket housing, through a mix of warehouse conversions and new-build developments. Following the arrival of the Jubilee line in 1999 (giving quick connections to the West End and to Canary Wharf) and the London Overground in 2010 (providing a quick route to the City of London), the rest of Rotherhithe is now a rapidly gentrifying residential and commuter area, with current regeneration progressing well around Downtown Road/Rotherhithe Street area and most quickly around Deal Porter Square at Canada Water, where a new town centre with restaurant and retail units as well as new residential developments is emerging around the existing freshwater dock and transport hub. Rotherhithe is located 4.5 km (2.8 mi) east of London's centre point. The name "Rotherhithe" is thought to derive from the Anglo-Saxon Hrȳðer-hȳð and it is suggested it means "landing-place for cattle". The first recorded use of this name was in about 1105, as Rederheia. Other explanations of the name have been 'Red Rose Haven' and 'rehra' (mariner's) hythe (haven or landing place). In the past Rotherhithe was also known as Redriff or Redriffe, however until the early 19th century, this name was applied to the whole river front from St Saviour's Dock to Bull Head Dock, this near the entrance to Surrey Water.. On the Ordinary Survey five feet to the mile, London 1893-6 maps, Redriff appears in two places, by Beatson Street and by Nelson Dockyard to Durand's Wharf. A map showing the Rotherhithe wards of Bermondsey Metropolitan Borough as they appeared in 1916. The docks were closed and largely filled in during the 1980s, and have now been replaced by modern housing and commercial facilities, but Rotherhithe retains much of its character and its maritime heritage. The largest surviving dock on the south bank, Greenland Dock, is the focal point for the southern part of the district, while there are many preserved wharves along the riverside at the north end of Rotherhithe. St. Mary's Church is at the centre of the old Rotherhithe village, which contains various historic buildings including the Brunel Engine House at the south end of the Thames Tunnel. Canada Dock was the dock basin furthest away from the River Thames in the Surrey Docks complex, and it was linked to Albion Dock and Greenland Dock at its northern and south-eastern extremities via the Albion Canal. The dock has been remodelled, and its northwest half retained as an ornamental lake, renamed Canada Water. The canal has remained as a walkway and water feature within the redeveloped area. Southwark Council and the Greater London Authority have announced a significant regeneration project focused on Canada Water and Rotherhithe. Known as the 'Canada Water Masterplan', the project has proposed the development of an additional 3,500 homes, as well as a new high street, town square, parks, leisure centre and footpath links. The landmark Tesco store will also be relocated. The project would be developed in multiple phases over the coming 15 to 20 years. Some local community groups oppose the plan based on environmental and cost considerations. Rotherhithe is the home of the football team Fisher F.C., which plays its games at St Pauls Stadium. The Championship team Millwall Football Club is located nearby in the London Borough of Lewisham. The sustainable transport charity Sustrans has proposed the construction of a bicycle and pedestrian swing bridge from Rotherhithe to Canary Wharf, and cost-benefit and feasibility studies were undertaken. In January 2009 the London Mayor Boris Johnson said he would not fund the bridge, citing budget cuts due to the credit crunch, with the result that the project was effectively put on ice. However the idea is still being supported by Sustrans. There are two Anglican churches in Rotherhithe St. Mary's Church, and Trinity Church. There are two Roman Catholic churches: St Peter and the Guardian Angels, and Our Lady of the Immaculate Conception. King's Stairs Gardens is a small park on the river towards the Bermondsey boundary. In September 2011 Thames Water announced that they wanted to build an access shaft for the "super-sewer" Thames Tideway Tunnel. Due to local action by The Save King's Stairs Gardens Campaign, which collected over 5000 signatures, it seems as of March 2011 that Thames Water will build the access shaft elsewhere, if the local community agrees. The Mayflower TRA Hall now occupies the site of the old Rotherhithe Town Hall. The building ceased to be a town hall in 1905 when the former Rotherhithe Council merged with the old Bermondsey Borough Council and the new council used premises in Spa Road. The old Rotherhithe Town Hall became a library and a museum. It was razed to the ground by repeated bomb hits and near misses during the Second World War (see below). Rotherhithe had its own general hospital, St Olave's Hospital, on Lower Road close to the old town hall. Built originally in the early 1870s on land adjoining Rotherhithe Workhouse, it became the infirmary of St Olave's Union in 1875, and was renamed St Olave's Hospital in 1930. Subsequently, becoming part of the Guy's Hospital Teaching Group in 1966, it closed in 1985 and the site has been redeveloped into the residential Ann Moss Way. The Terriss Theatre (named after the actor, William Terriss) opened in 1899 and was later renamed the Rotherhithe Hippodrome of Varieties. It stood on Lower Road by Culling Road. It was bombed in the 1940s and stood empty until demolition in 1955. When the roundabout facing the Rotherhithe Tunnel was redeveloped in the early 1980s, several 19th century buildings were demolished including a school and a nunnery. A public house, the "Europa", described in an early 20th-century history of the area as one its oldest, was also demolished. Max Bygraves frequently played piano there at weekends. The Daily Mail and Evening Standard newspapers were printed at Harmsworth Quays in Rotherhithe from 1989 to 2012. The site is now the "Printworks" events venue. Because much of the former Surrey Docks had strong trade links to Scandinavia and the Baltic region the area is still home to a thriving Scandinavian community. During World War II, in fact, it housed the Norwegian Government-in-Exile. Originally established as seafarers' missions, Rotherhithe is home to a Norwegian, a Finnish and a Swedish church. The Finnish Church and the Norwegian Church are both located in Albion Street; they were built in 1958 and 1927 respectively (Rotherhithe Library is located between them). There are also a number of "community centres" for the Nordic community in London, including hostels, shops and cafés and even a sauna, mostly linked closely to the churches. Some of the redeveloped areas were built by Nordic architects, such as the Greenland Passage development by Danish Company Kjaer & Richter. This gives some areas a distinctly "Nordic" feel in terms of house and street design. The relationship with Scandinavia and the Baltic is also reflected in the names of some of the buildings (such as the King Frederik IX Tower), the street names (e.g. Finland Street, Sweden Gate, Baltic Quay, Norway Gate, Helsinki Square) or other place names (e.g. Greenland Dock). Another major influence factor was trade with Russia and Canada (mainly timber), reflected in names such as Canada Water and the Russia Dock Woodland. Rotherhithe is also a popular place to live with South Africans according to the UK census of 2011 and there was a South African themed pub located at 351 Rotherhithe Street. In July 1620, the Mayflower sailed from Rotherhithe, picked up 65 passengers probably from Blackwall, and then proceeded to Southampton, on the south coast of England, to begin loading food and supplies for the voyage to America. At that time, the English Separatists, who later became known as the "Pilgrim Fathers", were mostly still living in the city of Leiden, in the Netherlands. There they hired a ship called the Speedwell to take them from Delftshaven in the Netherlands to Southampton to join the Mayflower. The ship's master, Christopher Jones, died shortly after his return in 1621 and he is buried in an unmarked grave at St Mary's Church. No one can be sure where on the Rotherhithe peninsula the Mayflower was berthed but the Mayflower pub, near St Mary's Church, claims the honour and on the wall of its restaurant has the names of the Mayflower passengers. The building itself, despite external and interior appearances, dates from the 1950s. The extent to which the pub was damaged during the Second World War, and was rebuilt or simply restored is uncertain. On Lower Road, about halfway between Surrey Quays and Canada Water stations, is a public house called the China Hall; at one time it was the entrance to a riparian playhouse visited by Samuel Pepys and mentioned in his diary. It is not known how long the theatre remained on the site, but it was reinvigorated in 1777 and during 1778 George Frederick Cooke acted there, but in the winter of 1779 it was destroyed in fire. The site of the theatre became a well-known tea-gardens, with the "usual arbours and 'boxes'" during the Victorian period, but by the 1920s most of the gardens had been absorbed into the Surrey Commercial Docks as part of a timber yard. Like the rest of the London Docks, the Surrey Commercial Docks were targeted by the Luftwaffe. On 7 September 1940, on the first day of the London Blitz, the deal yards of Surrey Docks were set ablaze. The raid ignited over a million tonnes of timber in Quebec Yard, causing the most intense single fire ever seen in Britain. The bombing of the old Rotherhithe Town Hall during the Second World War gives an indication of how heavy the bombing in Rotherhithe was. The first damage to the building occurred when Luftwaffe bombs landed nearby in April 1941, and there was more bomb damage in February and June 1944. Later the same month (June 1944) the Town Hall was very severely damaged by a direct hit by a V1 doodlebug. In November 1944 it was further damaged by near misses, and it was finally destroyed by one of the last V1s to land on London during the Second World War. King Haakon VII made many of his famous radio broadcasts to occupied Norway from Saint Olav's Norwegian Church in Rotherhithe, where the Norwegian Royal Family were regular worshippers during their exile in London. Rotherhithe is joined to the north bank of the Thames by three tunnels. The Thames foot tunnel to Wapping was the first underwater tunnel in the world. Built by the Brunels and originally intended to carry cross-river freight, it became a pedestrian tunnel, due to the money running out to build the necessary ramps for vehicle traffic. It was used as a railway tunnel from 1869, and is now part of the London Overground network, which on 27 April 2010 started running trains on the route of the former East London Line. The later Rotherhithe Tunnel (opened 1908) carries a two-lane road to Limehouse. The Jubilee line extension (opened 1999) has a railway tunnel to Canary Wharf in the Isle of Dogs. Parts of Rotherhithe Street were at one time or another called Jamaica Street, Lavender Street, Low Queen Street, Queen Street, Redriff Wall, Redriff, Rotherhithe Wall, Shipwright Street and Trinity Street. Rotherhithe is part of the SE16 postcode district. Electorally, the western half is Rotherhithe ward of Southwark London Borough Council and the eastern half in Surrey Docks ward. Marc Isambard Brunel (1769–1849) and his son Isambard Kingdom Brunel (1806–1859) built the Thames Tunnel between Rotherhithe and Wapping. Max Bygraves (1922–2012), entertainer, was born in Rotherhithe. Michael Caine (born 1933), actor, was born Maurice Joseph Micklewhite in Rotherhithe. Thomas Coram (1668–1751) a philanthropic sea captain, retired to Rotherhithe where he campaigned for establishment of the Foundling Hospital. Eliza Fay (1755 or 1756–1816), author of Original Letters from India (1817), was born in Rotherhithe. Malcolm Hardee (1950–2005), comedian, lived on a houseboat in Greenland Dock, Rotherhithe. He owned and ran the Wibbley Wobbley pub-boat on the same dock, and was drowned there. Alfred Hitchcock (1899–1980) filmed scenes in Rotherhithe for his first film as a director, Number 13 (1922), before it was pulled from production. Myleene Klass (born 1978), singer, lived in Rotherhithe in the early 2000s. George Lambourn (1900-1977), artist, was born in Rotherhithe. Aaron Manby (1776–1850) assembled and launched the world's first seagoing iron-hulled ship at Rotherhithe in 1822. Princess Margaret (1930–2002) met her future husband, photographer Antony Armstrong-Jones, in a house in Rotherhithe. Billy Mehmet (born 1985), professional footballer, attended Bacon's College in Rotherhithe in the 1990s. King Mutesa II of Buganda (1925–1969) died in exile in his flat in Rotherhithe in 1969 following an interview with journalist John Simpson. James Townsend Saward (1798–c1875) Victorian English barrister and forger was born in Rotherhithe. James Walker (1781–1862) worked on the design and construction of Greenland Dock, where a memorial bust of him stands. In the popular television drama series Upstairs, Downstairs the character James Bellamy stands as a Conservative Party candidate for the constituency of Rotherhithe East. The James Bond film Tomorrow Never Dies used Harmsworth Quays Printing as the scene for Carver's print works. Redriff was the fictional birthplace of Jonathan Swift's character Lemuel Gulliver, of Gulliver's Travels fame, and where his family waited for him. Rotherhithe is alluded to in the British Sea Power song Carrion and the Elvis Costello song New Amsterdam. Adam Carter from Spooks supposedly lives in Canada Wharf on Rotherhithe Street, and much of the series is filmed on locations around Rotherhithe and the Docklands. The final chapter of Charles Dickens's Oliver Twist (1839) provides a lively depiction of a Rotherhithe slum-district of the mid-19th century. The famous Gujarati poem, 'Rajashahi Ghodi', talks about a bicycle, allegorically a royal steed as it passes by the narrow by-lanes of Rotherhithe every morning, describing landmarks and monuments like the Mayflower Pub, the Picture Library and Southwark Park, along its way. A song from the musical Cats, "Growltiger's Last Stand", mentions the cottagers of Rotherhithe. "The man from Rotherhithe" is an unnamed, recurring character in the long poem In Parenthesis by David Jones. A period costumier, picture library and minor film producer Sands Films is located at Rotherhithe Street, close to the Mayflower pub. Long-running ITV series London's Burning was based at local fire station Dockhead for the first few series, with most scenes filmed in Bermondsey and Rotherhithe. For example, leading character 'Vaseline' was filmed drowning in Greenland Dock, and another leading character, Bert, campaigned to save the local city farm, filmed at Surrey Docks Farm in Rotherhithe. The 2004-2005 ITV drama series The Brief often filmed in Rotherhithe, with internal scenes filmed at the Mayflower pub. Lead character Henry Farmer, played by Alan Davies, lived a few doors away. 2007 film "The Riddle", starring Vinnie Jones and Derek Jacobi, was largely filmed on location in Rotherhithe. It features the interior and exterior of the genuine Blacksmiths Arms, Rotherhithe, although the rear of the pub in the film was a temporary set built adjacent to the Downtown nightclub, close to the Surrey Docks Farm. In "The Adventure of The Dying Detective", Sherlock Holmes pretends to Dr. Watson that he has contracted a contagious disease in Rotherhithe, while working on a case. The first and last episodes of Dempsey and Makepeace were filmed at the Mayflower public house and in the area. Rotherhithe is served by three stations. Near the river, in the north, Rotherhithe, formerly a London Underground station, was rebuilt as a London Overground station, and reopened on 27 April 2010, together with Surrey Quays to the south. In between lies Canada Water in central Rotherhithe. Canada Water station is now an important transport interchange, as it connects the London Overground (formerly East London line) and the Jubilee line of the London Underground, as well as having a bus station. This station is at the centre of a major regeneration project, with rapid construction of new flats. Other nearby stations are Bermondsey (also on the Jubilee line), South Bermondsey railway station to the south west, and London Bridge railway station to the west. The riverbank carries part of the Richmond to Thames Barrier (28 miles – 45 km) section of the Thames Path through London. Most of the riverbank is accessible, apart from sections where warehouses and estates have established rights to the riverside. A new bridge for pedestrians and cyclists has been proposed between Rotherhithe and Canary Wharf. The area is served by Transport for London bus services 1, 47, 188, 199, 225, 381, C10 and P12; and night buses N1, N199 and N381. London Taxis (black cabs) can often be found on Salter Road. Wikimedia Commons has media related to Rotherhithe. ^ "Southwark Ward population 2011". Neighbourhood Statistics. Office for National Statistics. Retrieved 13 October 2016. ^ "Canada Water Plaza - Canada Water Plaza". Southwark Council. 27 July 2010. Archived from the original on 11 November 2010. Retrieved 1 August 2015. ^ Butler, John A. "Southwark - Rotherhithe". www.jbutler.org.uk. ^ "Sustrans - Join the movement". sustrans.org.uk. Retrieved 31 March 2018. ^ "Brunel Bridge – a proposed pedestrian and cycling bridge between Rotherhithe and Canary Wharf". www.brunelbridge.london. Retrieved 1 August 2015. ^ Andie Byrnes (20 June 2013). "A history of Trinity Church, Rotherhithe". ^ "Rotherhithe Town Hall and Library". Retrieved 9 March 2018. ^ Blackman, James (28 May 2009). "Bring the statues back home to Rotherhithe". Southwark News. ^ "Parishes: Rotherhithe - British History Online". www.british-history.ac.uk. Retrieved 31 March 2018. ^ "48 hours in Scandinavian London". 24 February 2001. ^ "DataShine: Census". Retrieved 4 September 2015. ^ Cherry, Bridget; Pevsner, Nikolaus (March 1983). London 2: South. Yale University Press. ISBN 0300096518. ^ "Mayflower - Hidden London". hidden-london.com. ^ Wagner, Leopold (1921). A new book about London: a quaint and curious volume of forgotten lore. London: Allen & Unwin. pp. 190, 191. ^ Beck, Edward Josselyn; Bonney, Thomas George (1907). Memorials to serve for a history of the parish of St. Mary, Rotherhithe in the county of Surrey and in the administrative county of London. Cambridge University Press. pp. Appendix 259, 260. ^ Stansky, Peter (2007). The first day of the blitz: September 7, 1940 (illustrated ed.). Yale University Press. p. 81. ISBN 0-300-12556-9. ^ Harris, Clive; Bright, Neil (2010). A Guide to Wartime London: Six Walks Revisiting the Blitz (illustrated ed.). Casemate Publishers. pp. 69–70. ISBN 9781848841727. ^ McKenzie, Greg (12 March 2010). "World's oldest underwater tunnel opened to public". bbc.co.uk. Retrieved 26 September 2013. ^ "Outdoor Gyms". Leisure and Culture. London Borough of Southwark. Retrieved 3 September 2015. ^ Harris, Rhian (5 October 2012). "The Foundling Hospital". BBC. ^ "Kemnal Road History". www.kemnal-road.org.uk. ^ "Home - British Land : Canada Water Masterplan". British Land : Canada Water Masterplan. Retrieved 8 May 2017. Henden, Stephen. "V1 & V2 logs SE16 Rotherhithe and Bermondsey". Flying Bombs and Rockets. Retrieved 26 November 2010.